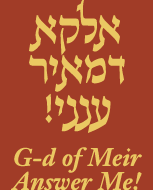 The RABBI MEIR BAAL HANEIS SALANT CHARITY is one of the oldest charity organizations in Israel. The RABBI MEIR BAAL HANEIS SALANT CHARITY was founded in 1860 by the saintly CHIEF RABBI of JERUSALEM RABBI SHMUEL SALANT (1816-1909) and his father-in-law the great and saintly RABBI YOSEF ZUNDEL SALANT (1786-1866). Rabbi Yosef Zundel Salant, a renowned and pious scholar and the spiritual mentor of the founder of the Mussar movement Rabbi Yisroel Salanter, arrived to Jerusalem in 1839 from the city of Salantai, Lithuania near Zamut. Rabbi Yosef Zundel was immediately appointed the head of the Ashkenazy community in Jerusalem. One of his first accomplishments was to establish a Jerusalem Ashkenazy Beis Din, the first in decades. Upon the arrival of his son-in-law Rabbi Shmuel Salant in 1841, Rabbi Yosef Zundel relinquished his position in favor of Rabbi Shmuel, who then went on to serve as the Chief Rabbi of Jerusalem from 1841 until his passing in 1909. Rabbi Zundel and Rabbi Shmuel worked together tirelessly for the benefit of the community. In 1860 they founded the Rabbi Meir Baal Haneis charity which became the foundation of support for the entire community at large, and saved it from sinking into financial abyss. Unfortunately, Rabbi Zundel lived for only a few short years after its establishment. However, during the final years of his life he devoted himself wholly to bring this monumental undertaking to fruition. Upon his passing in 1866, the Rabbi Meir Baal Haneis charity had already become the lifeline for hundreds of the country's poorest and most destitute families. The 1860's was a time of poverty and hardships in Palestine. There was a tremendous influx of Jewish families from all over the world who took a tremendous leap of faith to leave their respective homelands to settle in the Holy Land. The destitute communities in Israel began an unprecedented descent into abject poverty, the likes which it had not seen in decades. Hundreds of people died of illness brought on by malnutrition and hunger, particularly infants and young children. The dire situation threatened to engulf the entire country and put an end to Jewish existence there. Rabbi Shmuel Salant with Rabbi Zundel Salant rose to this monumental challenge, and founded the central Rabbi Meir Baal Haneis Salant charity fund to provide for all of Israel's impoverished families and save them from oblivion. This fund united the entire community under its umbrella and issued and incorporated many regulations and ordinances which provided fairness and equality to all the various factions within the community. This new charity entity was enthusiastically endorsed and supported by all the leading rabbis and lay leaders of Israel and the Diaspora. That very same year in 1860, Rabbi Meir Auerbach (1815-1878), a world acclaimed Rabbi and towering scholar and author, immigrated to Israel. Rabbi Auerbach had been the Chief Rabbi of Kalish, an important city in central Poland. Rabbi Salant, in his keen wisdom and insight, appointed Rabbi Auerbach as assistant Chief Rabbi of Jerusalem. This turned out to be a tremendous blessing for the community, as Rabbi Auerbach was an indefatigable community activist and proved to be an indispensible asset to Rabbi Salant. He also assisted in managing the Rabbi Meir Baal Haneis Salant fund. Unfortunately, Rabbi Auerbach passed away at a relatively young age in 1878 and Rabbi Shmuel Salant was once again left to run the community alone. In 1888 Rabbi Shmuel Salant's eyesight began to fail. Although he did not allow this debilitating disability to stop his wide-ranging activities in communal affairs, the urgency of finding an appropriate assistant became critical. Rabbi Eliyahu Dovid Rabinowitz-Teomim (1845-1905), world famous scholar and author, and Chief Rabbi of Mir. Rabbi Rabinowitz-Teomim was born near Kovno in 1845. In 1873 he was invited to the rabbinate of Ponevezh, the fifth largest city in Lithuania. Twenty years later he was appointed Chief Rabbi of Mir. Upon the advice of Rabbi Chaim Ozer Grodzensky of Vilna to Rabbi Shmuel Salant, Rabbi Rabinowitz-Teomim was chosen to assist the elderly Rabbi Salant. This was done with an eye towards eventually taking full charge of the Jerusalem Rabbinate, if and when Rabbi Shmuel felt unable to discharge his duties to his advanced age. For five years Rabbi Salant & Rabbi Rabinowitz-Teomim worked together tirelessly for the benefit of the Jewish settlement and the Rabbi Meir Baal Haneis charity fund. Unfortunately, Rabbi Eliyahu Dovid Rabinowitz-Teomim predeceased Rabbi Shmuel Salant, passing away in 1905 at the early age of sixty. Once again Rabbi Shmuel Salant was left all alone to lead the community. Rabbi Chaim Berlin (1832-1913) the son of Rabbi Naftali Zvi Yehuda Berlin (known as the Netziv of Volozhin) had previously been the Chief Rabbi of Moscow in 1865, of Volozhin in 1889, of Kobrin in 1892, and of Elizavetgrad in 1897. In 1906 Rabbi Berlin moved to Jerusalem. Due to the efforts of Rabbi Shmuel Salant, Rabbi Chaim Berlin was elected to join the Rabbinate of the Ashkenazi community in Jerusalem in the capacity of Assistant Chief Rabbi. Rabbi Chaim Berlin assisted Rabbi Salant in all the affairs of Jerusalem and the Rabbi Meir Baal Haneis Salant charity fund. Rabbi Shmuel Salant passed away on Monday, August 16 (29 Av) 1909 at the age of ninety three. He was mourned by the entire Jewish world, and particularly by the Jerusalem community which he so faithfully led for almost seventy years. He was buried the next day on the Mount of Olives. Before his passing, Rabbi Salant inscribed his last will and testimony and pledged that one who supports the Rabbi Meir Baal Haneis Salant charity will merit heavenly blessings and divine mercy. Rabbi Chaim Berlin continued to stand at the helm of the Jerusalem Rabbinate and the Rabbi Meir Baal Haneis Salant charity until his passing in 1913. Shortly afterwards in 1914, World War One broke out. The communities in Palestine became in total disarray. The Chief Rabbinate position of Jerusalem was empty. A special Vaad or Committee of rabbis was established to fill the void. The Vaad consisted of all the great Rabbis of Jerusalem of both Ashkenazy and Sephardic persuasion. Rabbi Yitzchok Yeruchim Diskin (1839-1925) was appointed President, Rabbi Tzvi Pesach Frank (1873-1961) Vice President, Rabbi Chaim Moshe Eliashar (1845-1924) Chairman, Rabbi Yisroel Porat (1845-1924) Honorary Secretary, and Rabbi Yosef Chaim Sonnenfeld (1848-1932) Secretary & Treasurer. Despite the disruptive and chaotic environment in Eretz Yisroel and the devastation that World Wars One and Two brought in its wake, the Rabbi Meir Baal Haneis Salant charity remained steadfast in its sacred task of dispensing critical aid to Israel's poorest and most deserving families. With the help of the Almighty and in the merit of its founders, The Rabbi Meir Baal Haneis Salant charity continues to be a lifeline to needy and destitute families, year after year, generation after generation, until this very day. Rabbi Meir Baal Haneis Salant is also privileged to have the enthusiastic endorsements of Israel's current leading rabbinical authorities and Torah leaders, may they live and be well. The remarkable legacy of RABBI MEIR BAAL HANEIS SALANT is vibrantly alive and potent to this very day. Stories abound of men and women who, during personal need and crisis, experienced miraculous help when they gave charity to this holy fund. Surely you too can use an extra blessing in your life! SUPPORT RABBI MEIR BAAL HANEIS SALANT!